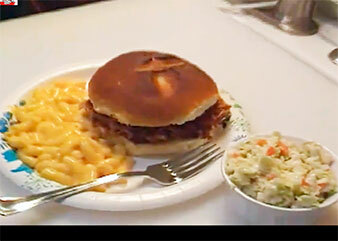 This Pulled Pork meal can be served in a soft roll, with a side and salad. Yum! This BBQ Pulled Pork meal is another very easy and delicious dinner to make in your pressure cooker. It’s easy and complete in an hour. Set the Pork Loin into the pressure cooker pot. Fold over if you need to. Pour in the Chicken Broth. Add the Dried (or fresh) Garlic, Onion, and Pepper. Set the pressure cooker to High, and set the Timer to 60 minutes. When the cooker is finished and depressurized, remove the contents from the pot to a serving bowl, including any bits from the bottom, which have tremendous flavor! Using a pair of forks, shred the very tender meat by pulling it apart. Pour a good amount of BBQ Sauce over the pulled pork, and mix well. The meat will absorb some of the BBQ Sauce, so add more sauce so that it isn’t dry. Hi! This looks like a really great recipe! Thanks for sharing! Do you have any idea how I would adjust the recipe for a 1.5 lb pork loin? I appreciate any help you can provide! I’m trying this one now! I saw many others but this one seemed to be better. Hope it’s delish!! I’m so excited to try this for Easter! I have a 6.8lb roast, should I double the time? Or maybe just do 90 minutes? I’m new to pressure cooking! I received my pressure cooker for my birthday. We just did the pulled pork. We loved the pork and pressure cooker! This looks really good! Hubby doesn’t care for garlic, so I’ll omit that, but plan to make this tonight! Hi! I wanted to say thanks for the recipe – I was going to do our pulled pork in the crockpot but I’m so glad I used my EPC and your recipe instead – it was so fast and sooo tender and moist. I used a pre-marinated black pepper 1lb tenderloin (for 2 people) and lowered the time to 50minutes. It was AMAZING – it just soaked up the BBQ in seconds and tasted like it had been mixed in it for hours. Thanks again for a keeper! Hi, That’s fantastic! I’m so glad that you liked the recipe. Thank you so much or sharing that. Looking forward to this recipe gonna try it tonight . Excellent Jon, I’m sure it turned out well. Did you enjoy it? 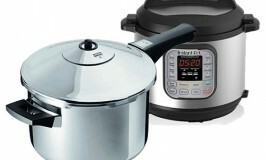 There are tons of recipes online for you to try with your pressure cooker! Also, check out YouTube if you’d like to watch some videos showing different meals. You’ll soon have some favorites. Have fun buddy! Congrats on your new pressure cooker! You must be so excited, I know I was when I first got mine. I know you’ll enjoy the pulled pork when you try it. Have fun, and thanks for stopping by!